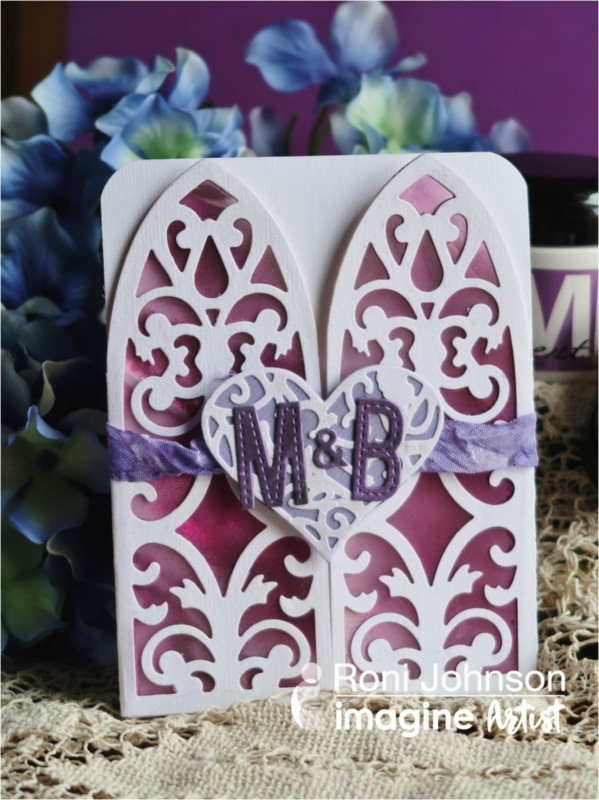 Die cut card base, matching panels and filigree hearts from plain white cardstock. 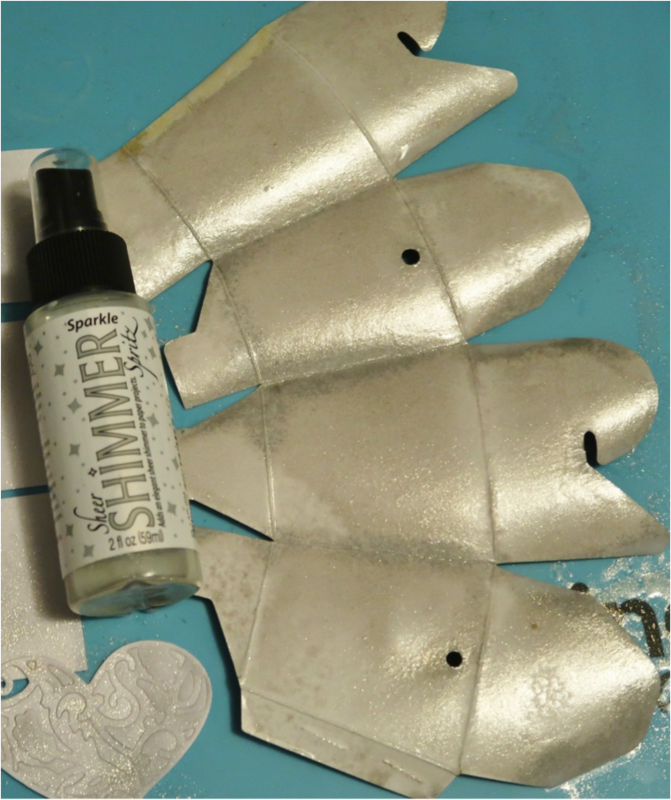 Mist the card, panels, and heart with Sheer Shimmer Spritz in Sparkle and let dry naturally. Die-cut solid heart from lavender cardstock. 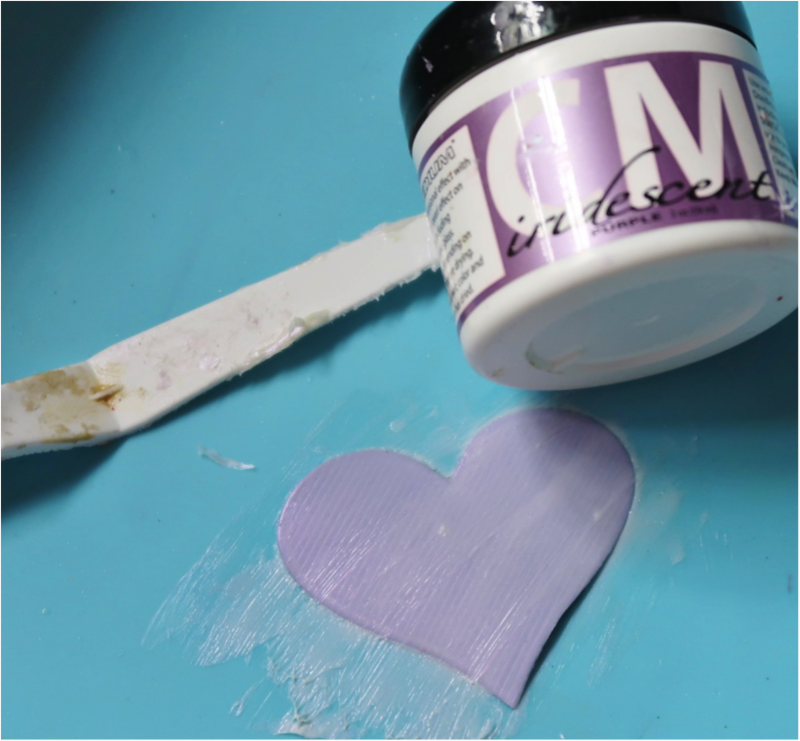 Spread an even layer of Iridescent Purple Creative Medium over the heart using a palette knife. 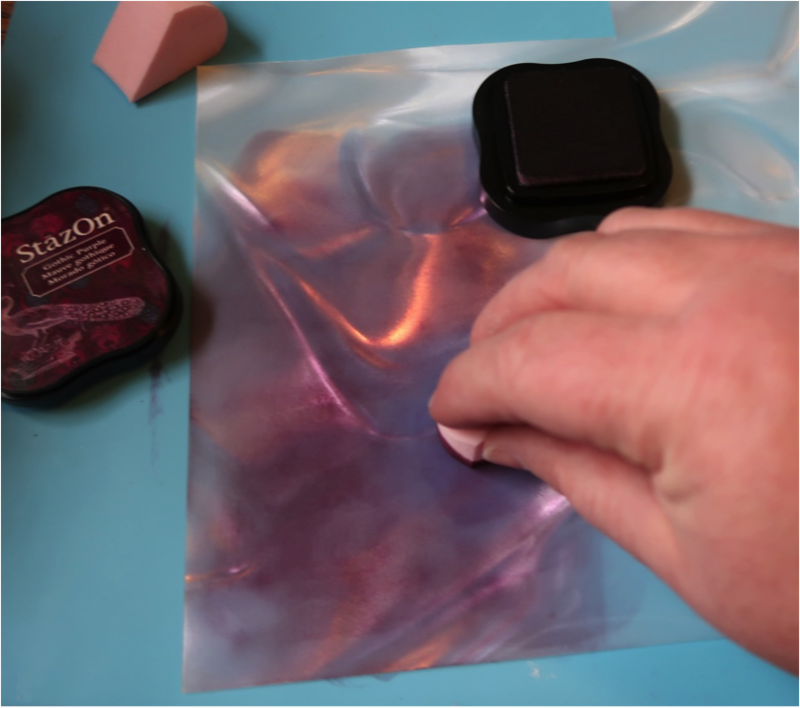 At this time, spread a layer of the Purple Creative Medium over a large piece of black cardstock and set both aside to dry. Sponge Gothic Purple Staz On ink over a sheet of Vertigo Film. 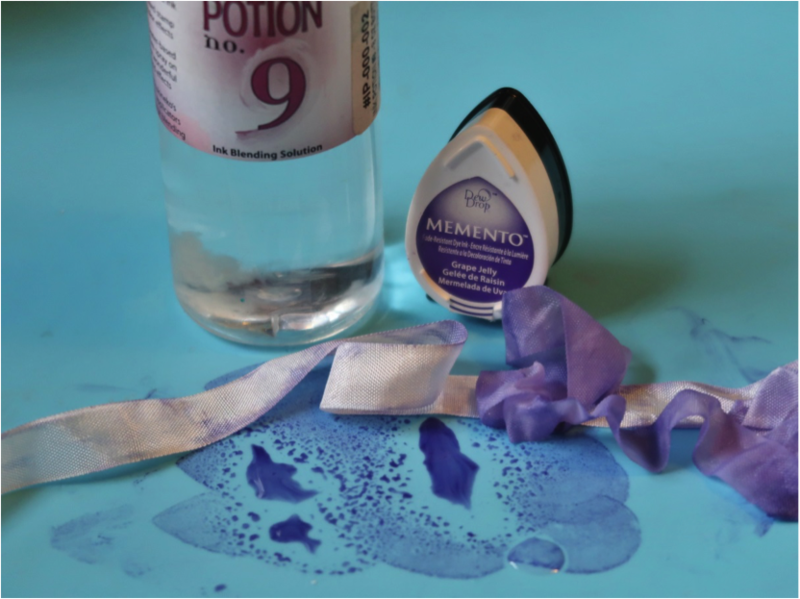 Pounce Grape Jelly Memento Ink on the craft mat, spritz with Ink Potion No. 9, scrunch up a length of white rayon seam binding and dab it in the ink mixture. Set aside to dry. Once all of the elements have dried trim two pieces of the Vertigo Film to the size of the filigree flaps. Adhere the Vertigo Film to the card using On Point Glue sandwiching the film between the card flap and extra filigree screen. 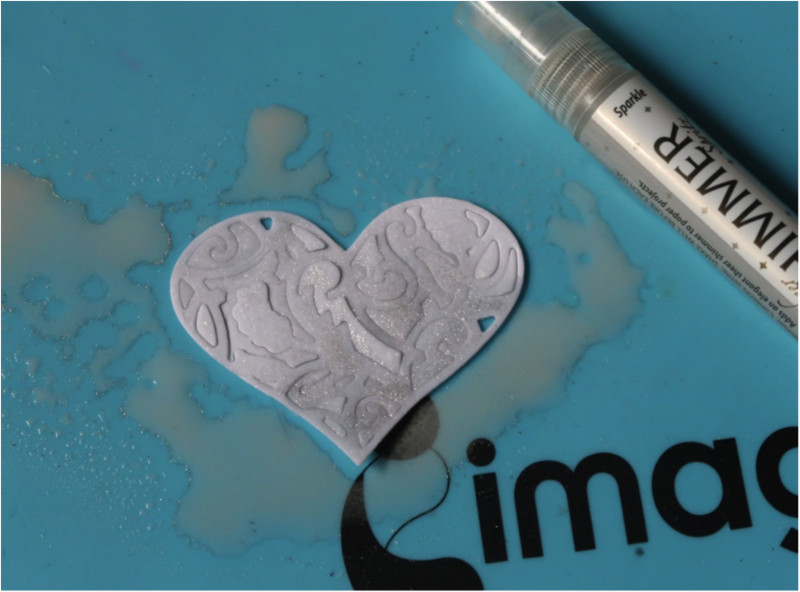 Adhere the Sparkle filigree heart to the lavender heart using On Point Glue. Die cut letters and “&” sign from the black Creative Medium covered cardstock and adhere to the center of the heart. Adhere one end of the ribbon to the card, adhere the other end to the heart. 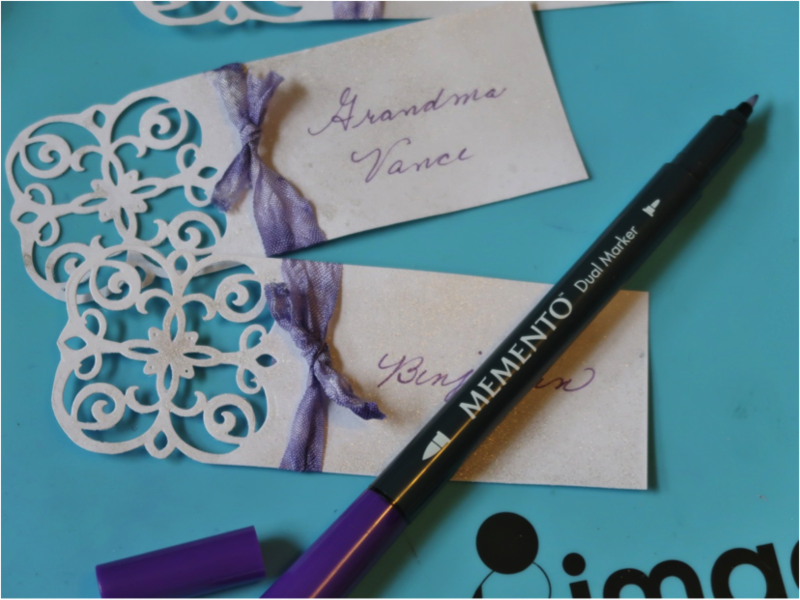 Wrap the ribbon around the card and secure the heart to the card with a Velcro dot. Insert computer generated invitation panel to the inside of the card. 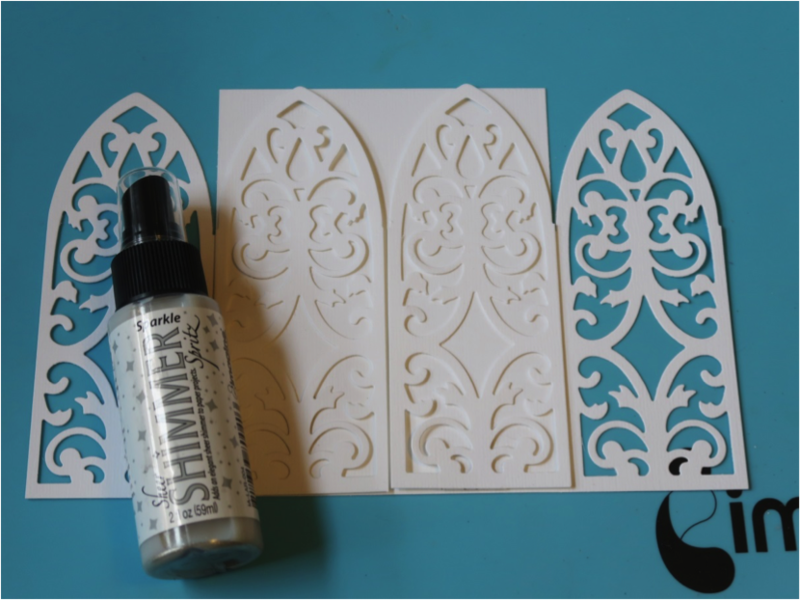 Die cut filigree design on a strip of cardstock. 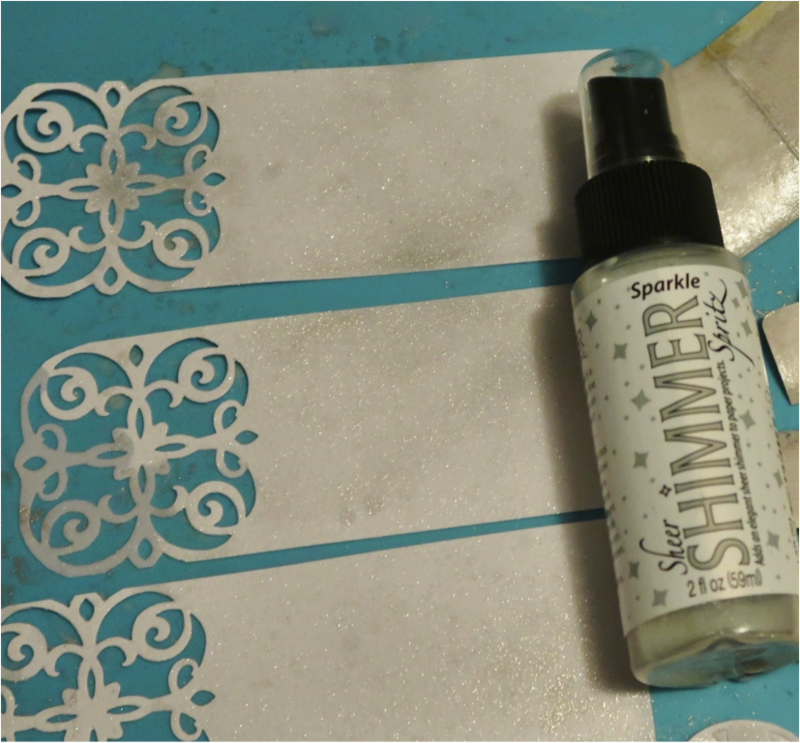 Spritz the die cut strips with Sparkle Sheer Shimmer Spritz. Tie a piece of the dyed seam binding around each place card. Cut a piece of scrap cardstock 1×2 inch and fold in half to form a small tent. 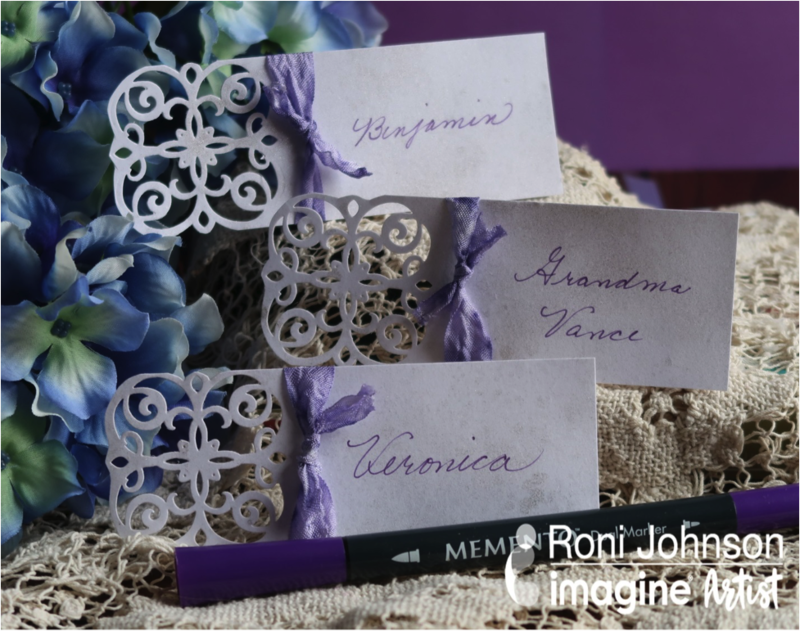 Adhere the tent to the back of the place card.Write each person’s name on the place cards using Grape Jelly Memento Dual Tip Marker. Download Free Box Pattern. Cut several favor boxes from white cardstock using pattern provided; score along all fold lines. 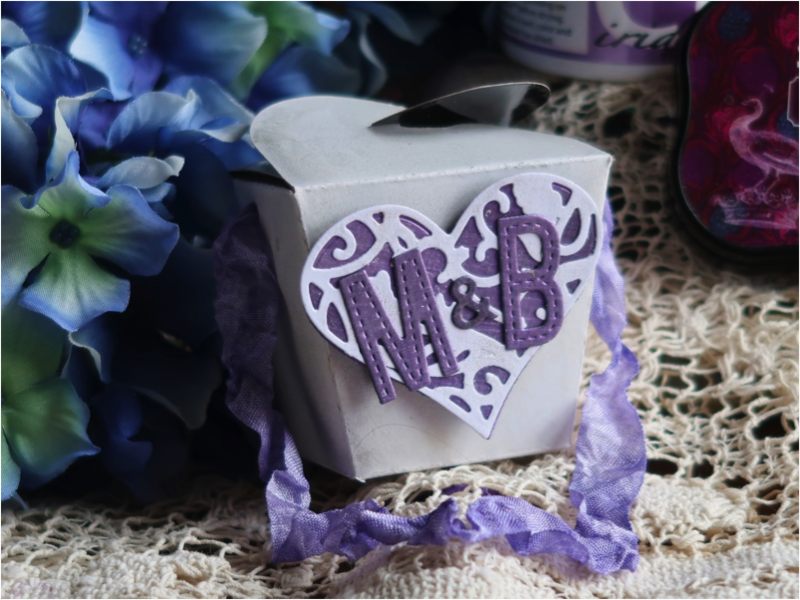 Die-cut enough filigree and solid colored hearts for each favor box. Spritz treat boxes and filigree hearts with Sparkle Sheer Shimmer Spritz and let dry. Assemble hearts the same as the on the invitations. Assemble the box using Tear It Tape. Make the handle using dyed rayon seam binding; affix heart to the front of the box. Fill each box as desired. Happy Monday! Here are two motivating projects that.. should move you! Whether you like to shake or slide we got you covered with two handmade cards by Alison and Roni. Hello! A Botanic Hello that is! Today, I have a card to share for Imagine’s current challenge, which is “Movement,” made with Mama Elephant’s Botanic Hello stamp. This theme had all sorts of ideas swirling in my head, but I decided to make a shaker card, filled not just with sequins, but seed beads as well. I started by coloring this beautiful image, which I stamped with VersaFine Onyx Black. This stamp may seem daunting at first, but if you break it down into chunks, coloring it can go pretty fast. I started with the leaves on the outside, then the blue flowers, and last the group of purple flowers. I fussy cut the image, then added glitter to the “hello.” On the top third of the letters, I applied On Point Glue, sprinkled on glitter, and shook off the excess. I repeated this step twice more for the entire word. 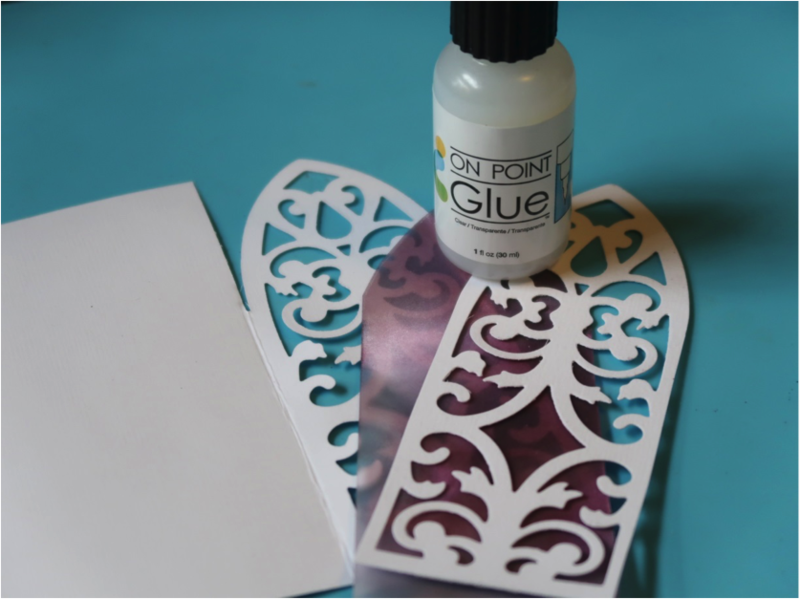 On Point Glue dries quickly, but I let it sit aside while I chose my cardstock colors. My card base is made out of Grasshopper cardstock and was cut to 6 1/2″ x 10.” I created my layers with my Sizzix dies and paper trimmer. I assembled the shaker box in the standard way, by applying a piece of acetate to a cardstock frame, adhering foam tape to the back, and applying it to the card base. As I mentioned earlier, I added not only sequins, but seed beads as well, which I thought added great texture, movement and sound to the card. On the frame of my shaker window, I sprayed Sheer Shimmer Spritz Frost for that extra special finishing touch. The card has such a big shaker window…my kids and I have a hard time not playing with it! Thank you so much for visiting. Have an inspiring day! Motion…the action or process of being moved. In the sea of interactive mechanisms in cardmaking, papercrafting and scrapbook pages, I had a hard time deciding which one to use. I stumbled upon this tutorial by Kay Williamson called the Waterfall Technique and knew I could take this basic concept with a few modifications and turn it into a fun, interactive motion card. I choose a “Make a Wish” birthday theme card with bambo and teal imagery. I am super happy how it turned out and for those who have a little bit more time this technique is worth it. Have you ever seen Vertigo and thought it looked cool but wondered what to do with it? Check out the video below by Nadine Carlier showing how she turned an adult coloring book image and some Vertigo into a cute sun catcher to hang in a window. Or it can even be used as an embellishment for a card or scrapbook pages!